Ofuji handing over a handscroll to Okita. Japan: colour woodblock print. Bijinga. 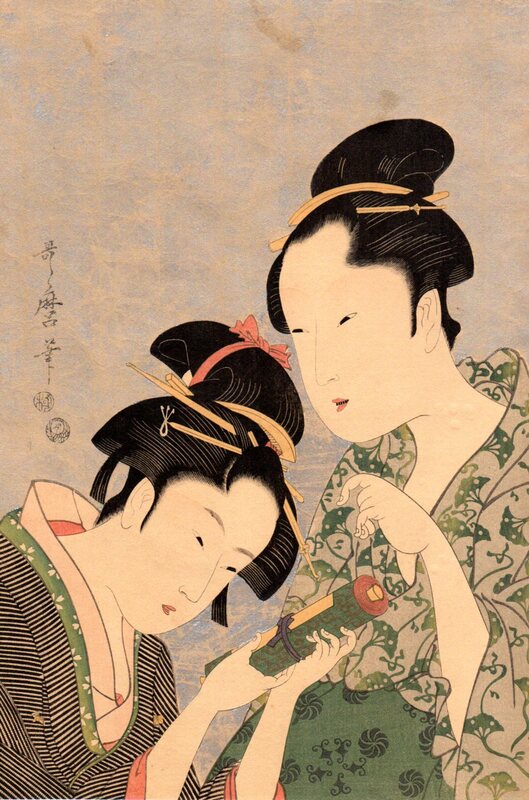 Edo c. 1793-1794. Heigth: 37.9 cm; width 24.7 cm. Read more on the website of the British Museum. 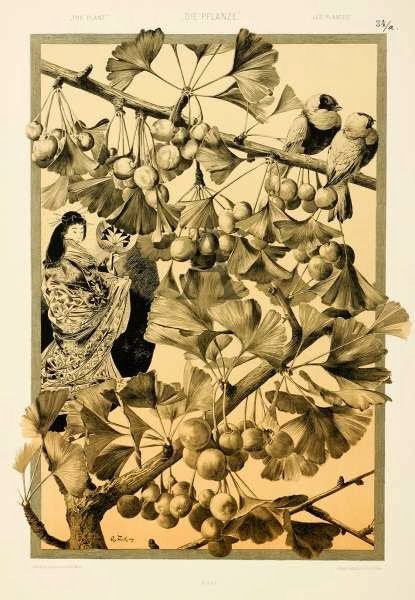 German photo-lithograph of Ginkgo in "Die Pflanze in Kunst und Gewerbe" (1890) by Anton Seder. * New Photo of the Month + video on photospecial page: Ginkgo trees in Amsterdam in fall. * Added photo of Ginkgo in St. Petersburg, Russia. *Added on my Usage-page: music video of popular nursery song Ginkgo biloba. 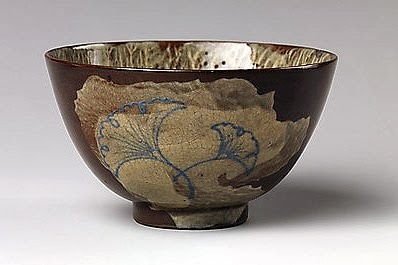 Ceramic tea bowl with decoration of Ginkgo leaves, 1691-1749. Edo period Japan. Stoneware with cobalt-blue design over brushed cloudlike white slip (Utsutsugawa ware). View more info and enlargement on website of Metropolitan Museum of Art. "Kitakanegasawa no-ichou", symbol Ginkgo tree with many chichi, over 1,000 years, girth 22 m, h. 40 m, natural monument. Location: Kita kanegasawa in Nishitsugaru-gun, Fukaura-mach, Aomori Prefecture, Japan. Video of this famous tree on YouTube.